'Manifest' Season 1 Episode 3 Recap: "Turbulence"
“This is about every person who was on that plane. 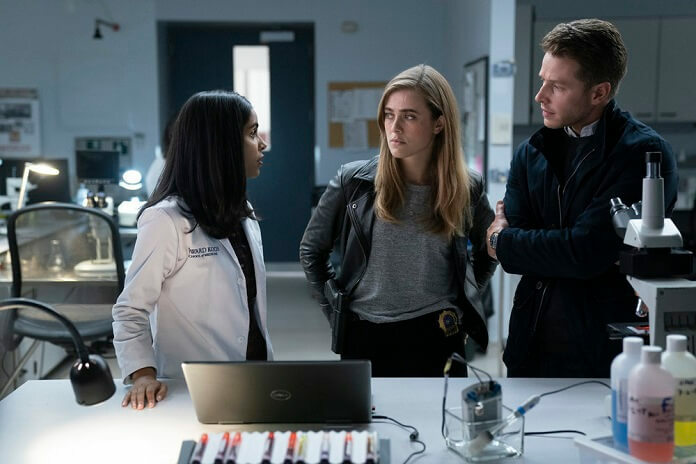 We could be next,” says Michaela (Melissa Roxburgh) to her brother, Ben (Josh Dallas), as they learn a survivor from their flight has been murdered in season one episode three of the NBC dramatic series, Manifest. The episode begins with a flashback focusing on the female passenger who was murdered. Her death was unveiled at the end of the second episode and it’s revealed she complained on a phone call that the flight was delayed taking off. During the flight, Michaela and Ben chatted and she praised his marriage to Grace (Athena Karkanis). She believed that despite everything they’ve been through fighting their son’s cancer, they have a great relationship. 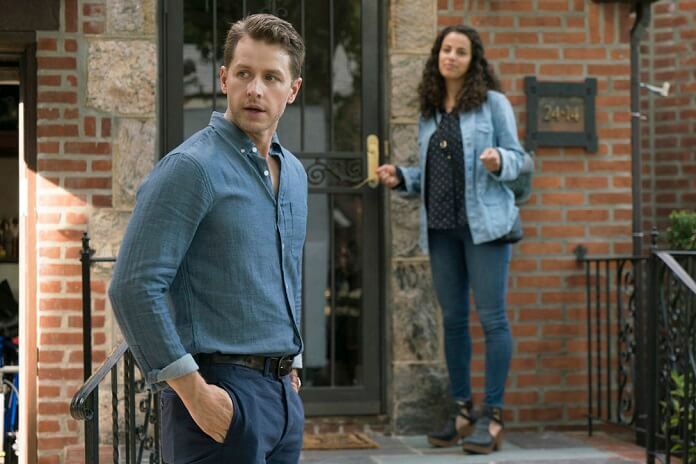 Flash-forward to present day and after Ben and Michaela learn about the murdered passenger, Grace gets scared and wonders if they’re going to be a target too. Ben suggests everyone play it safe and not leave the house alone. His daughter, Olive (Luna Blaise), sneaks out her bedroom window but her brother, Cal (Jack Messina), sees her go. Dr. Saanvi (Parveen Kaur) calls Ben with some news. It seems she’s detected something in Cal’s blood that wasn’t there in earlier tests. She’ll keep him up to date but wants to try something. Michaela asks Ben to drive her to Long Island so she can go to the crime scene and see what she can find out. She admits she doesn’t want to drive after the car accident. A flashback shows the horrible accident in which Michaela was driving when her friend was killed. Ben agrees to take her. On the way there, Ben and Michaela argue about how to go about it. Michaela wants Ben to just stay in the car and let her do all the work, but he refuses to be a silent bystander and tells her he’ll be quiet and let her do the talking but he’s coming along. He explains he needs to be involved because it’s not just them but also his family that could be in danger. Michaela tries to argue but Ben says he’ll turn the car around, so she agrees. Once at the crime scene Michaela learns from the lead detective that he deduced it was a robbery gone bad. The victim, Kelly Taylor (Julienne Hanzelka Kim), had a necklace torn from her neck after she was shot dead. They have a suspect in custody who has blood on his shirt. The NSA agent overseeing everything to do with Flight 828 inserts himself in the case and tells the detective he’s taking over. He instructs Ben and Michaela to wait outside. While outside, the sibling’s talk to Kelly’s husband, Patrick Taylor. He confesses that she had been acting different since returning and had been claiming she had a calling. Taylor then goes into his house. The next day, Grace takes Cal with her to work while Ben’s ready to start job hunting. Michaela watches the interview Kelly gave to the press and hears a key phrase. She asks Jared (J. R. Ramirez) to make some calls and see what he can find out about the Taylors. Jared is reluctant but agrees. Michaela catches up with Ben and tells him Kelly kept saying “own your truth.” That’s a phrase that has been stuck in her head, too. Concerned, they speak with Kelly’s husband again and he repeats that she changed and kept talking about black SUVs always driving and parking near the house. The Taylors’ maid backs up Patrick’s story about Kelly’s behavior. As they’re about to leave, Michaela flashes on going to see her friend’s parents at the reception after the funeral. She remembers how they turned her away at the door. Ben notices Michaela has frozen and helps her out. At work, Grace tells a co-worker she’s ended her affair with her lover, Danny. However, she admits she feels like she’s cheating on Danny by being back with Ben. Michaela decides to attempt to visit the mother of her deceased friend, and she’s shocked to find her warm and accepting of her visit. She discovers from the woman’s husband that she has dementia and doesn’t remember her daughter dying. Michaela leaves, upset. Michaela returns to work and asks Jared what he found out. He notices she’s upset and she explains what happened during the visit. He tells her to stop punishing herself and then says he found out Kelly and Patrick owned a mall. Ben’s at home checking for surveillance devices when he gets a call from Dr. Saanvi. She tested her own blood and she has the same anomaly in her blood as Cal. She explains she’s going to try something and will call him later. Kevin, an old friend of Cal’s, shows up and briefly talks to Ben. Ben believes Kevin’s there to see Cal and he’s surprised to learn he’s actually there to visit Olive. Grace gets home from work and sends Kevin off, telling him to call Olive later after they’ve had dinner. Cal tells on Olive about sneaking out, something that upsets Ben. Olive’s upset with her brother but walks away not wanting to deal with it. Grace warns Ben he shouldn’t make a big deal over Oliver sneaking out to see Kevin, explaining he’s been a good guy to Olive. A little later, Michaela tells Ben about Kelly owning the mall. She suggests that maybe Kelly got the message wrong about owning it the same way they got it wrong when they thought the voice was telling them to free the dogs and it was actually about freeing imprisoned kidnapped girls. Ben and Michaela decide the best course of action is to head to the mall to check it out. At the mall a worker runs away from them. When they finally catch up to her she admits she did fight with Kelly but didn’t kill her. She was afraid Kelly was going to demand the money her husband was extorting from his workers, but Kelly actually apologized and said all of that was going to stop. Back at Ben’s home, Olive asks Cal why he “broke their code” and rated on her. He admits he’s upset she’s dating his former best friend and it bothers him that she’s five and half years older now. Olive hugs Ben and tells him it will always be them against the world. Meanwhile, the NSA agent speaks to Michaela’s boss and he defends her. The agent also chats with Jared, asking him to spy on Michaela. He warns Jared not to make him an enemy. Following Michaela’s investigation, Patrick’s arrested for being a slum lord and for extortion. But, his alibi during the time period his wife was shot checks out. He didn’t kill her. Ben returns home to find his door ajar. He picks up a baseball bat and confronts the man in his house who, it turns out, is a friend of Grace’s. Ben and Grace talk and she admits that she made new friends and they helped her while he was missing and presumed dead. Michaela visits the man the police have in custody. He knows her name and says she’s chosen. He claims he would never hurt Kelly or anyone from Flight 828. He admits he heard the gunshot and found Kelly lying on the floor, so he picked her up and held her. He tells Michaela she needs to be pure. Michaela returns to visit the parents of her dead friend again and finds the husband upset. He tells her his wife has wondered off and the 911 operator told him to stay at the house in case she returns. He begs Michaela to go looking for her and gives her his keys. Michaela gets in the car and flashes back to before the accident when her friend was too drunk to drive but would not let Michaela call an Uber. She wanted to drive herself home and Michaela, also intoxicated but not as badly as her friend, said she’ll drive them home. Flash forward and Michaela is able to force herself to drive around and search for her friend’s mom. Michaela finds her in the middle of the street and swerves to miss her, but an oncoming car crashes. She checks on the driver and discovers it’s Patrick and Kelly’s maid. The woman has Kelly’s necklace on the passenger seat. Michaela immediately arrests her. During an interrogation, the maid finally admits she killed Kelly because she took better care of Patrick than her and she didn’t want to be treated like the help again. Afterward the interrogation, Jared asks Michaela what’s going on. Michaela tells him it’s better if he doesn’t know. That night, Ben asks Grace about the guy she got together with while he was gone. He wonders if she loves him. Grace assures Ben she loves him and never stopped loving him. “We are picking up where we left off,” says Grace. Michaela plays cards with the mom of her dead best friend with the approval of her husband. Later, Michaela and Ben visit Dr. Saanvi who’s been calling them to talk. She tells them about the anomaly and says it’s something that happens when someone suffers a stroke. She thinks maybe they all had a close brush with death and that could be the cause. She wanted to do a test on Kelly’s brain to confirm her suspicions but when she went looking for her body, she learned the Feds had taken it and are keeping its location secret.